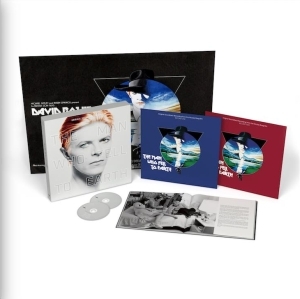 comprehensive bowie box set including the never before released ‘The Gouster’, this is a must-have for any self-respecting Bowie aficionado. A film as enigmatic as Nicholas Roeg’s 1976 cult classic ‘The Man Who Fell To Earth’ is always going to conjure up mysteries in its wake & one of the biggest has always has been the fate of the film’s soundtrack. The film itself reached cult status due to David Bowie’s outstanding performance as Thomas Jerome Newton, an alien that finds himself stranded on Earth. At the time 'The Man Who Fell To Earth' confirmed the film’s director Nicholas Roeg & book’s author Walter Tevis, as on the cutting edge of their respective fields & many critics have said that the film contains Bowie’s finest acting work. The soundtrack has always been highly celebrated & long sought after by fans but until now unavailable as a body of work: it can now finally be acknowledged in its own right Due to lost tapes recently being uncovered.